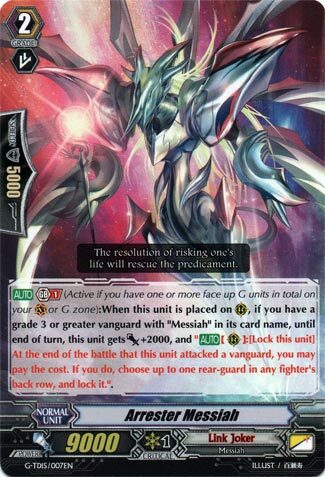 [AUTO] Generation Break 1 (Active if you have one or more face up G units in total on your (VC) or G zone):When this unit is placed on (RC), if you have a grade 3 or greater vanguard with “Messiah” in its card name, until end of turn, this unit gets [Power]+2000, and “[AUTO](RC):[Lock this unit] At the end of the battle that this unit attacked a vanguard, you may pay the cost. If you do, choose up to one rear-guard in any fighter’s back row, and lock it.”. I mentioned stuff that lock after attacking yesterday. Well, here’s one. Lady Fencer is the other. Mostly this thing exists for the multi-attack combos, as the capacity to lock is limited to boosters, so the opponent can still attack. That’s not a point in its favour. But really Messiahs don’t even primarily seek to disrupt the opponent a la Chaos so that doesn’t matter too much, and Basaltis can hit what this can’t. The newest Link Joker Trial Deck sees this reprint of a long-time Messiah staple, and this card remains as useful in its niche as ever. Thanks to its ability to lock itself after it attacks as well as the fact that unlocked cards are always unlocked as Standing units, Arrester is one of many tools available to facilitate multi-attack shenanigans for Messiah players. What’s up, Rogue Squad?! Sorry about missing out on Dunames Messiah, but I had some important issues to deal with, but that’s all settled with, so let’s have a look at an oldie Messiah. Arrester Messiah is still a solid card to play even with the new support they received. With that being said, however, I don’t see it as more than a 2-3 of now since Messiahs now have more options for their Grade 2 lineup, but if you want to do multiple attacks with lock/unlock combos, then you still definitely run this.